One of the best fishing spots north of Simcoe Lake is the French River. For the past 50 years, the French River has developed a good reputation for being a great fishing spot with plenty of fishing lodges and resorts to choose from. In fact, along the French River the number one attraction is the fishing. Each year, thousands of individuals from all over Canada and the United States to try their hand at getting some of the most sought-after fish in Ontario. Some of the species that call this river home include the walleye, muskie, largemouth bass, perch, sunfish, rock bass, smallmouth bass, trout and northern pike. Some more adventurous anglers even come out to try and catch the elusive sturgeon, large channel cats and whitefish. Since the French River runs for 110 kilometers and flows into many lakes that dot the area, before emptying into the Georgian Bay, there is an abundance of fishing opportunities. Every type of fishing area you can conceive of can be found along the French River including fast moving areas, weedy bays, coves, rocky points, mid-river shoals and flats. The policy of catch and release has also helped to increase the population of the fish in the rivers and lakes. This has not been the only effort by local governments and associations to improve the fish stocks of the river. A walleye hatchery program was tried in 1987, but natural spawning is preferred now. In addition, water quality testing is done routinely, as are checks of the oxygen levels. One of the biggest plusses of fishing along the French River is the amount of solitude that it offers. While other areas of Ontario have great fishing, they also have a lot of people. 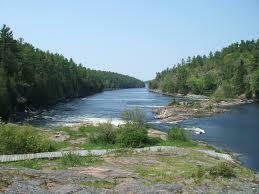 For the anglers who want peace and quiet with their fishing, the French River is the best place to go. Many canoes can be seen on the river in the summer months as people take to the river for some peace and quiet, mixed in with some fishing. The Upper French River area is home to over 40 different species of fish and the French River welcomes all levels of anglers, from beginners to experts. Even young anglers can find they are able to catch some great perch and sunfish without much effort at all. There is a reason why Jesuit Priests in the 1600s thought the natives were using magic because of all the fish they caught from the river.